Young Cricket and Master Mantis as they appear in WarioWare Gold. 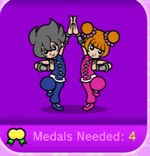 Young Cricket and Master Mantis are two characters first appearing in WarioWare: Smooth Moves. They are said to be roaming the world in search of new poses, suggesting that they already know about the Form Baton. When they are first introduced, they appear to be rather serious characters, shown training through tough conditions, but it is then revealed that they "fit in" with the rest of Wario's friends. Young Cricket and Master Mantis make their debut in WarioWare: Smooth Moves. Their story starts with the two characters being very hungry. They find a place to buy dumplings. Cricket starts running on people's heads to the front of the line. Then the game starts. Every time a microgame is lost, one dumpling is taken by someone. When getting an extra life, a new one is laid on the table. Eventually, Cricket reaches the front of the line, only to be looked down upon by the people he stepped on. He runs on their heads again back to Master Mantis and tells him that they should get in line. In WarioWare: D.I.Y., they run the Assembly Dojo. They also appear as comic stamps. Young Cricket and Master Mantis also appear in Game & Wario, where they host the Kung Fu minigame. Their training routine and love for dumplings is addressed once again, with their game combining both as the player controls Young Cricket through a series of obstacle courses, collecting dumplings along the way to regain energy. Young Cricket is also depicted on a bowling pin in the Bowling minigame, alongside other major characters from the game. Both characters have their own entry for the Miiverse Sketch Masterpiece Collection, videos uploaded by the official Nintendo of Japan YouTube account showcasing drawings made with the Miiverse Sketch mode. The sixth video has "Bee" as its theme and features commentary by Young Cricket; Master Mantis provides commentary for the eighteenth video, whose theme is "Stag Beetle." Young Cricket and Master Mantis observing the Diamond City Amusement Park map. In WarioWare Gold, Young Cricket and Master Mantis are the hosts of the fourth stage of the Touch League, with the Sports theme. In their story, they are training in an amusement park. Cricket analyzes about how dangerous two rides are, and then decides he is ready to prove himself. Mantis leads him to a merry-go-round known as Precious Prancers, where Cricket is ready to start his trial after overreacting about how dangerous the attraction is. After Cricket survives the trial, Lulu jumps on his shoulder, which Mantis then notices. Cricket tells Lulu to get off of him, which shocks her. Mantis then proceeds to the next trial, the "Trial of the Lost Child." They are later seem at Club Joe alongside Jimmy T., Mona, Kat, Ana, Dr. Crygor, Penny, Mike and Fronk. Cricket's fighting moves end up attracting a large crowd, while Mantis' dancing techniques have the opposite effect. At the end of the game, Cricket and Mantis are among the group who demands Wario to pay them for the microgames they designed for the Wario Bowl. After Wario trips and lets his money briefcase fall, Mantis tells Cricket to use his new learned technique, the "Precious Prancing Pounce", to stop Wario from escaping further. All of Wario's friends then decide to split the remaining money equally between them as Cricket holds off Wario from interfering. The duo's appearance in Wario... Where? The pair makes an appearance in the Wario... Where? version of Rhythm Heaven Megamix. The set's version of Munchy Monk features Master Mantis in place of the monk and a cloud-riding Young Cricket in the background. In Super Smash Bros. Brawl, Young Cricket has a Sticker. It raises a player's attack by three. In Super Smash Bros. for Wii U, Young Cricket can be seen on the sketchpad in one of randomly generated layouts for the Gamer stage. In Super Smash Bros. Ultimate, Young Cricket appears as a Spirit. Rank C – This young man is devoted to training under Mantis. He desires mastery. And craves meat dumplings. Rank B – Cricket is often seen at a Chinese restaurant in Diamond City. He spends a lot on food there. Rank A – Cricket obeys his master so fully that when Mantis says training must happen at a fancy café, he hops to it. Rank C – Mantis is a master of the martial arts. He's extremely strong. Trains with his dutiful student, Cricket. Rank B – Uses a martial-arts technique known as Wii Form Style, though increasingly interested in Quick Switch Style. Rank A – Believes that training can happen anywhere, usually where he wants to be. Fairly recently, at a lovely café. when the player succeeds in Assembly Dojo. when the player fails in Assembly Dojo. ↑ 5.0 5.1 NintendoRU. (January 10, 2019). WarioWare Gold — трейлер персонажей Юный Крикет и Мастер Мантис (Nintendo 3DS). Retrieved March 30th, 2019. This page was last edited on April 14, 2019, at 20:58.